My husband and I have always had a happiness trick that we have used throughout the years and that is to play Saturday night! 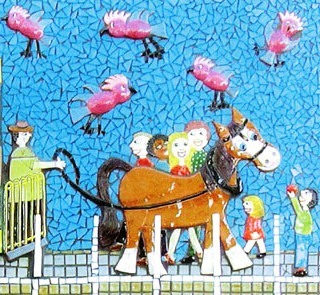 Art to make you feel good! You know when you have those days or weeks where life gets you down, the car won’t start in the morning and then you get the electricity bill which throws you and then you drop the jar of jam which makes a mess everywhere. Mmmm… that is when my husband and I looks at each other and decide now we got to play “Saturday Night”. Now for us a bottle of red wine is a must but of course, use whatever drink is your favourite. When we were having money problems early on in our marriage the budget would only stretch to a $4 dollar bottle of wine, but that didn’t spoil our fun one bit, it tasted just fine to me at the time. If you feel like talking do so over dinner but if you need to just switch off get a good movie and just get lost in it. When the kids were little we always had chip and dip and lollies on a Saturday and watched a family movie together before they went to bed and then we would continue with the adult version of our Saturday night! 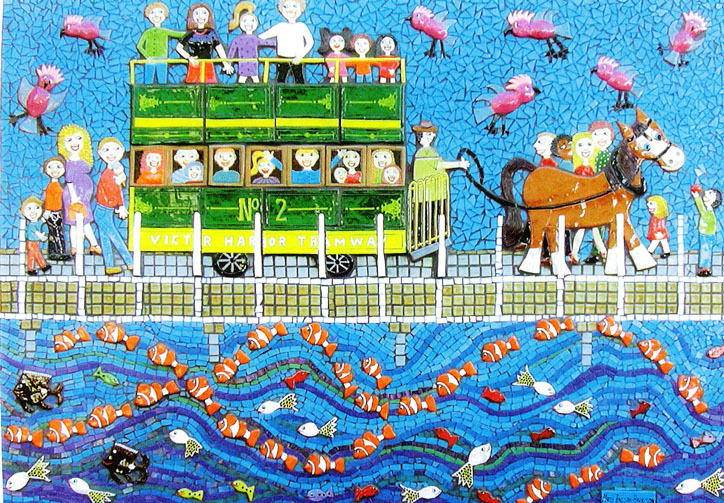 Of course you could also schedule in a picnic or a day’s outing as you can see in this handmade ceramic and mosaic artwork – where we are going to Granite Island, South Australia. Of course painting,sculpting and just creating anything has always helped me be happy too. So I would really recommend that – a hobby of some kind, even cooking is creative. If you have little kids they may enjoy an extra Saturday night every week too. We swear by it, of course whatever problems you have are still there in the morning but to take a little vacation from the stress and worry even if it is only for a few hours, certainly has always helped us. Oh before you think that our poor kids were fed a diet of chip and dip and lollies I have to say that during the week both at school and at home we all ate a very healthy diet, so once or twice a week to be able to have some “naughty” foods made it all the more special. Just as sometimes if we went to an all you can eat type of place we would let the kids attack the dessert bar before their main course, lol. This happened rarely mind you but it was so worth it just to see their excited little faces! Till next time, happy painting or sculpting!